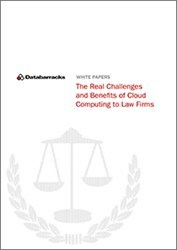 Infrastructure as a Service (IaaS) provider, Databarracks, has today launched its white paper ‘The Real Challenges and Benefits of Cloud Computing to Law Firms’. More and more firms are opening their eyes to cloud services and how they can be adapted to markedly improve IT provision. The paper investigates the current state of the cloud according to a variety of senior IT professionals from within the legal sector including Berwin Leighton Paisner, Sidley Austin LLP and Stephens Scown Solicitors. Written by Frank Jennings, Commercial and Cloud lawyer at DMH Stallard LLP and Chair of the Cloud Industry Forum’s Code Governance Board, the paper examines experiences and attitudes of those who have adopted cloud services. It highlights their common concerns and perceived barriers to entry, most prominently security of data. It quickly became apparent that there has been a significant lack of guidance from the Solicitors Regulation Authority regarding how cloud services should be deployed within the legal sector. Yet despite this lack of clarity, the paper reveals a refreshingly positive attitude towards the use of these services. The findings suggest that many IT professionals in the legal sector have been quick to realise the benefits of cloud computing and are already reaping the rewards. Aimed at providing the legal sector with practical and credible insight from leading industry peers, the research focuses on the use of Infrastructure as a Service (IaaS) and Software as a Service (SaaS), as well as public, private and hybrid cloud deployments. Peter Groucutt, Managing Director of Databarracks says: “One of the most interesting findings from the research from our perspective was how fluid the use of cloud terminology is within the legal sector. Attitudes towards public and private clouds factor in a number of issues, often going beyond the issues we as providers tend to focus on. Legal professionals appreciate the flexibility of cloud services and are using this to their advantage.